Yes! I’m showing some rugs at Pacific Textile Arts http://www.pacifictextilearts.org/ in Ft.Bragg, CA. ; an old lumber town on the Mendocino coast. We’ve scheduled it for February 2 – 24, 2018 and finish it up with a talk, Feb.24 and a workshop, Feb.24-25. Please join me at this workshop; I’m working on a little beginner kit that can be made into a little purse or pouch. 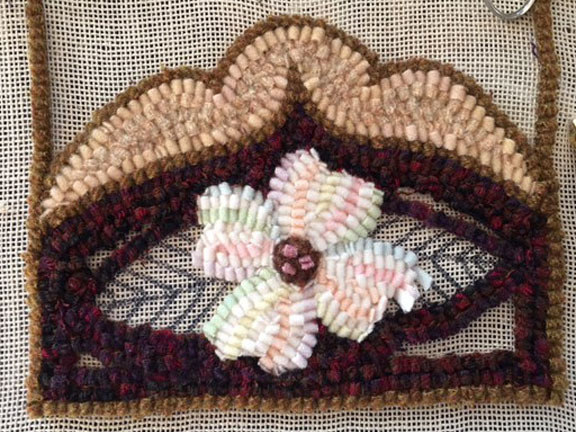 it’s just enough to get a person started on traditional rug hooking and explores various aspects of this wonderful, forgivable, fiber art! Some green leaves will balance out this colour plan, I think… There’s another design on the other end with a similar layout. Then, students will fill the in-between area with noodles from my noodle stash. Should be fun! I’ll have more information to share and post after the holidays… Hope you are enjoying this time of year; getting together and celebrating!